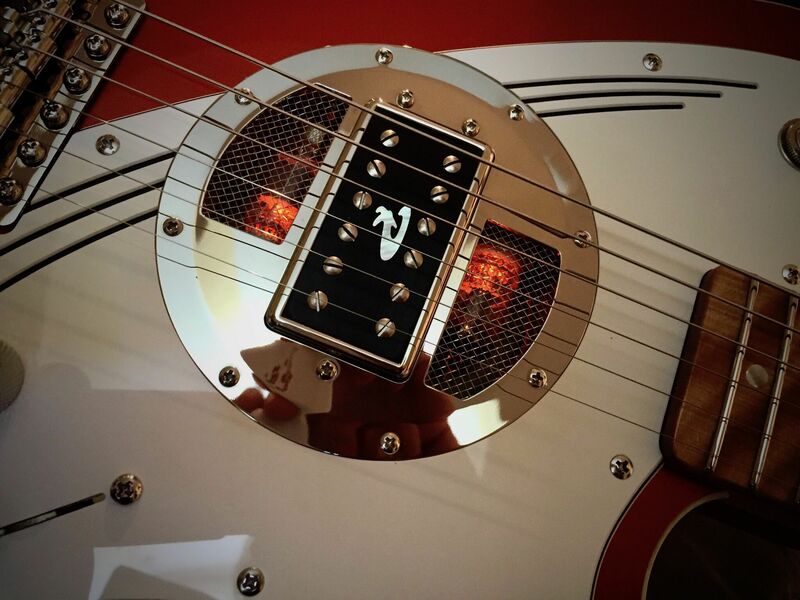 The Valvebucker® is “just one pickup” – and yet, it offers a whole array of different sounds. The Valvebucker® functions in a different way than other pickups, and thus a guitar equipped with a Valvebucker® doesn’t quite fit any old school genre of guitars – its wide tonal spectrum and organic dynamics are simply different from other guitars. The design architecture of the Valvebucker® circuit is noteworthy, making use of sweet spots found from outside the typical operational points of vacuum tubes, by using relatively low voltages. The power consumption of the Valvebucker® remains within the given values also during startup – an important feature when using commercially available pedal power units. Every Valvebucker® unit is handmade and finetuned individually in Finland. The Valvebucker® design team is: Lassi Ukkonen (the designer of Simble Overdrive, etc), Jorma Kostamo, Jyrki Kostamo and Juha Ruokangas. The Valvebucker® will be introduced at The NAMM Show 2019. 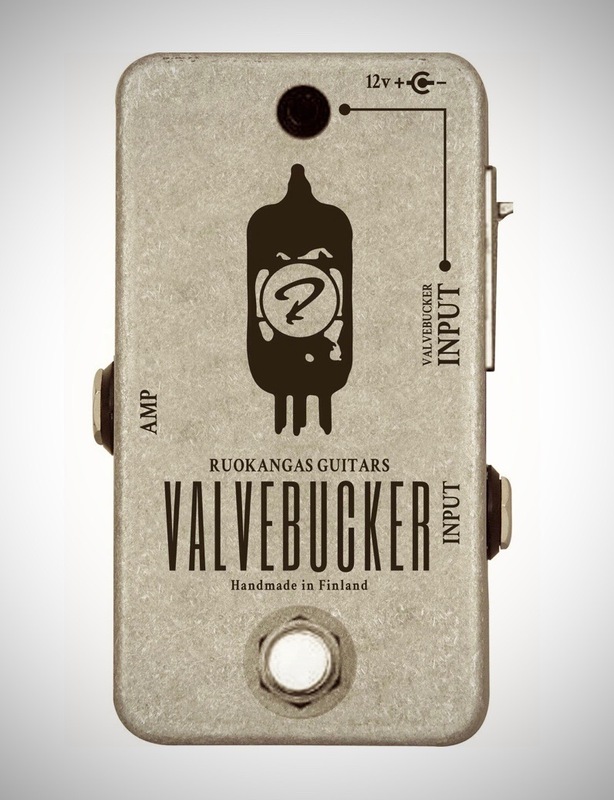 The Valvebucker® is available as a custom option for Ruokangas guitars from January 2019 on, adding EUR 1200 to the cost of an ordered instrument. Your Valvebucker -equipped guitar comes with a floor unit in the size of a standard guitar FX pedal. You connect the Valvebucker guitar to the floor unit with a standard XLR microphone cable. 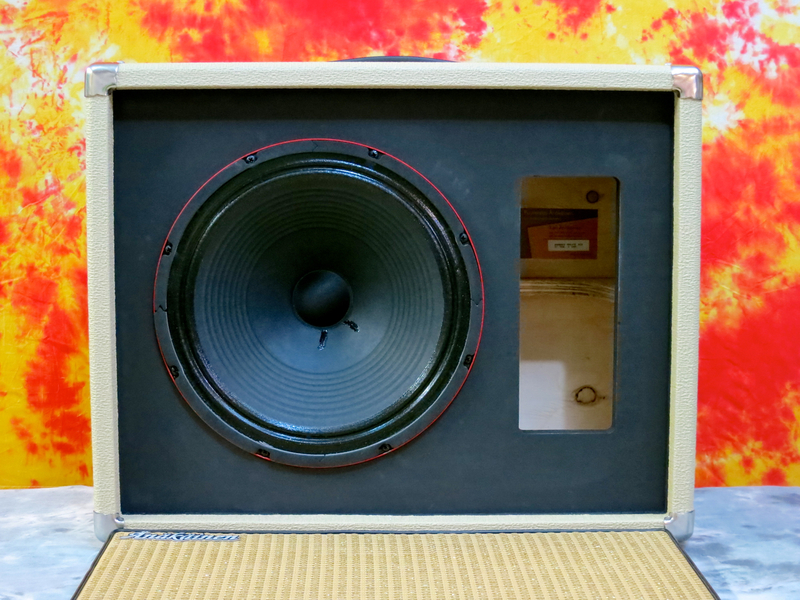 The Valvebucker is powered through the floor unit, that connects to a 12VAC power source. Use either your regular pedal power (12VAC, min. 250mA) or the power supply provided with the guitar. The floor unit has two inputs and a true bypass A/B switch to easily alternate between the Valvebucker -equipped guitar and the rest of your guitars. The signal chain continues through the floor unit normally to your pedalboard and/or amplifier. Dumble-style overdrive pedal designed by Lassi Ukkonen and made by Mad Professor. • Lead guitar – Fender Stratocaster & Bluetone Shadows Jr.
• SENSITIVITY: Amount of distortion and compression. • ACCENT: Adjusts the pick attack and brightness before the signal is overdriven. • CONTOUR: Brightness of the output. • Current draw: 10 mA at 9V DC approx. Uusi Änäkäinen Simo 3D -kaappi on 2.1-tyylinen Wet/Dry/Wet-kaiutinkaappi akustiselle ja sähkökitaralle. Kaapin laidalla on PA-/Hifi-kaltainen stereofoninen kaksitie-ratkaisu, kun taas keskikaiuttimeksi on valittu Celestion Tonker Lite. Änäkäisen Simo 3D -kaapin idea on, että stereopuolelle ajetaan stereofoninen, kaiutettu signaali, samalla kun keskikaiuttimella hoidetaan kuivan signaalin vahvistamista. Triodipajan Lassi Ukkonen on ollut mukana suunnittelemassa kaiutinta, ja myös jakosuodin on hänen tekemänsä. Tehonkesto on Änäkäisen uutukaisella peräti 200 wattia (keskikaiutin: 100 W/stereopuoli: 2 x 50 W), ja painoa vaivaiset 19 kg. Kotelo tehty suomalaisesta havuvanerista ilman ruuvin ruuvia puuseppämeiningillä. Hinta asiakkaalle: 1.480 €. Puuverstas Änäkäinen have just introduced their brand-new Simo 3D guitar cabinet, which is a 2.1-style Wet/Dry/Wet-cab for both acoustic and electric guitar. The Simo 3D cabinet’s stereo sides are equipped with a PA-style two-way speaker system, while a Celestion Tonker Lite has been selected for middle speaker duties. 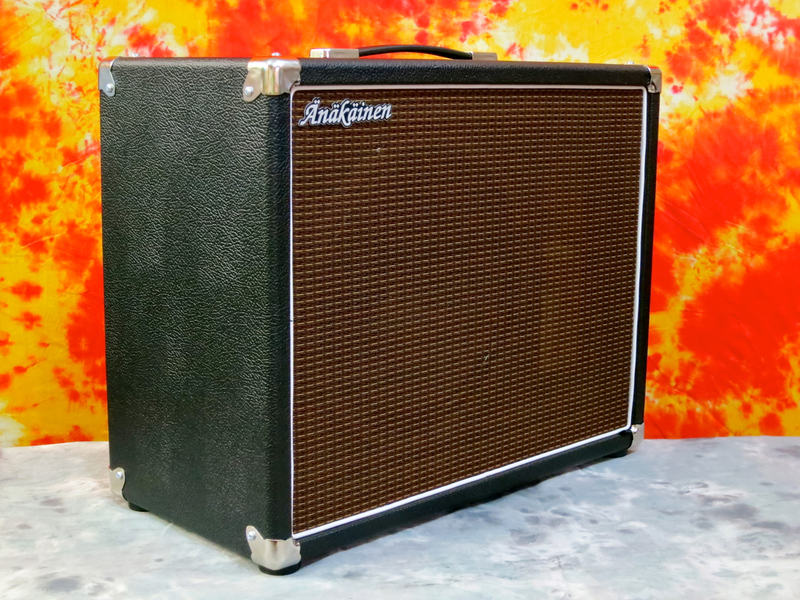 The 3D cab is meant to be used in a Brian May-style way – you run an effected stereo signal into the sides and feed a dry guitar signal to the middle speaker. Triodipaja’s main man, Lassi Ukkonen, has taken an active part in this cab’s design. Ukkonen also developed the audio crossover used in the Simo 3D. 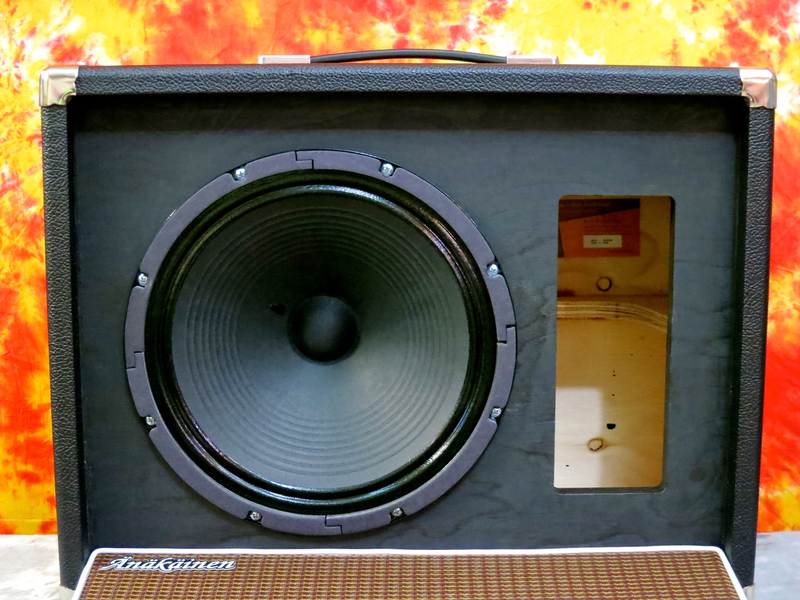 Änäkäinen’s new model has a power rating of a whopping 200 W (Celestion: 100 W/stereo speakers: 2 x 50 W), while the weight has been kept surprisingly low at only 19 kilos. The cabinet is crafted from Finnish softwood plywood, all traditionally jointed without screws. Prices start from 1,480 €. 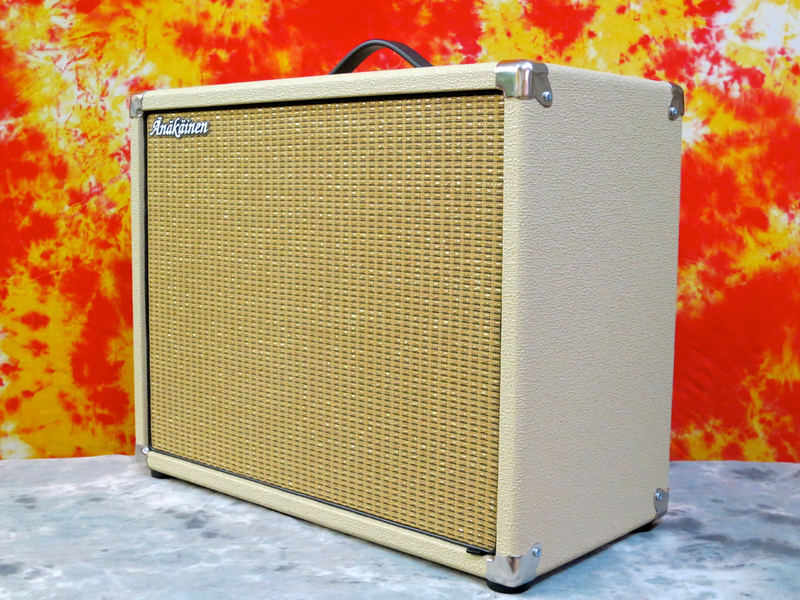 Puuverstas Änäkäinen’s Rumble 1 x 12 -cabinet (prices in Finland start around 580 €) offers a few fresh ideas on how to come up with a cracking guitar tone. The fathers of the Rumble-concept are cabinet maker Kari Änäkäinen (try saying: Curry ANNA-kay-nun), who is also gigging as a guitarist and bassist, and Kuusankoski’s very own tube amp guru, Triodipaja’s proprietor Lassi Ukkonen (LUSS-cee OO-cow-nun). The guys hit upon the basic idea for the Rumble cabinet, when Kari asked Lassi to calculate the correct cubic content for a lightweight bass cabinet he was building for himself. The bass cabinet turned out very well and set the duo on the path to coming up with the Rumble. When it comes to the cosmetics of his Rumble cabinets, Kari Änäkäinen is a dyed-in-the-wool vintage fan. …while the other clearly points in the direction of moody Marshall-ness. The Rumbles sport metal corner protectors. 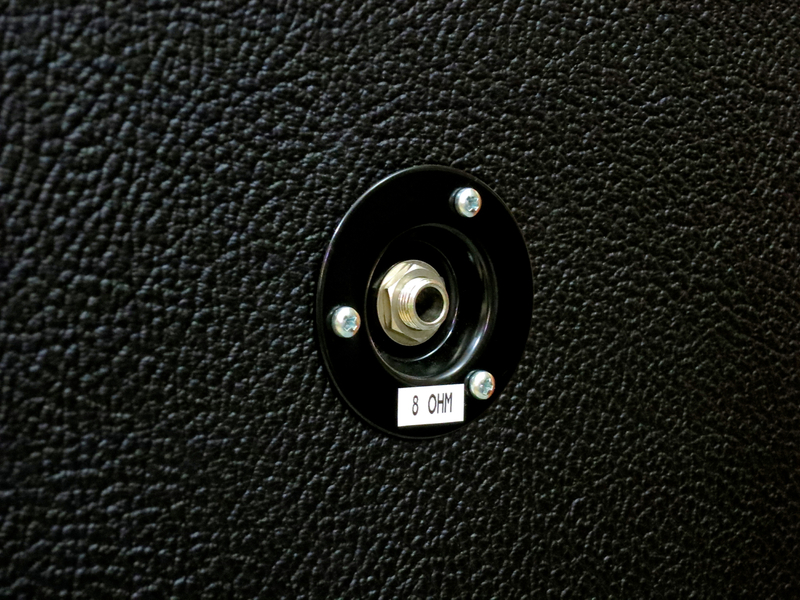 Here you can see the impedance sticker affixed to the sturdy jack plate. Currently, Kari Änäkäinen gives you a choice of five different speaker models for your personal cabinet. 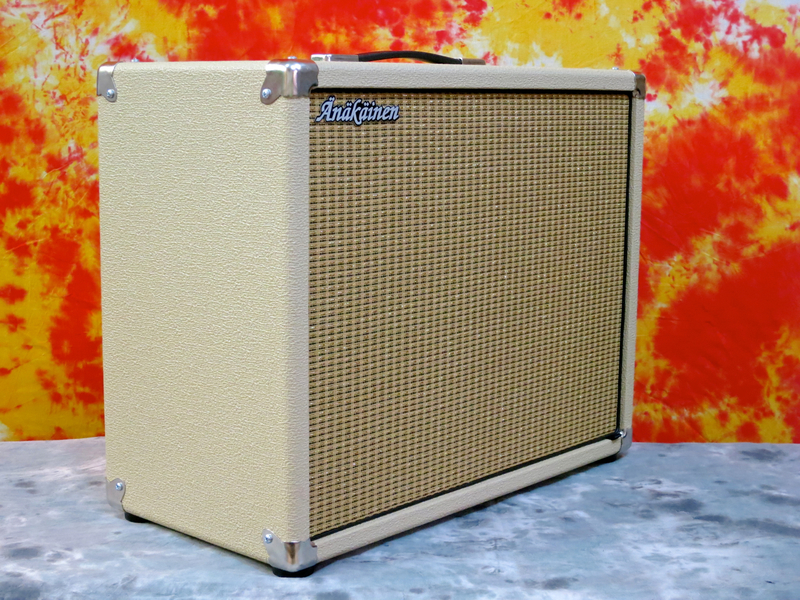 The cream-coloured Rumble came equipped with an Eminence Private Jack -speaker (50 W/8 Ω). A WGS:n Reaper (30 W/8 Ω) was chosen for the black counterpart. As you can see in these pictures, one of the special features of all Rumbles is the large rectangular port on one side of the cabinet. 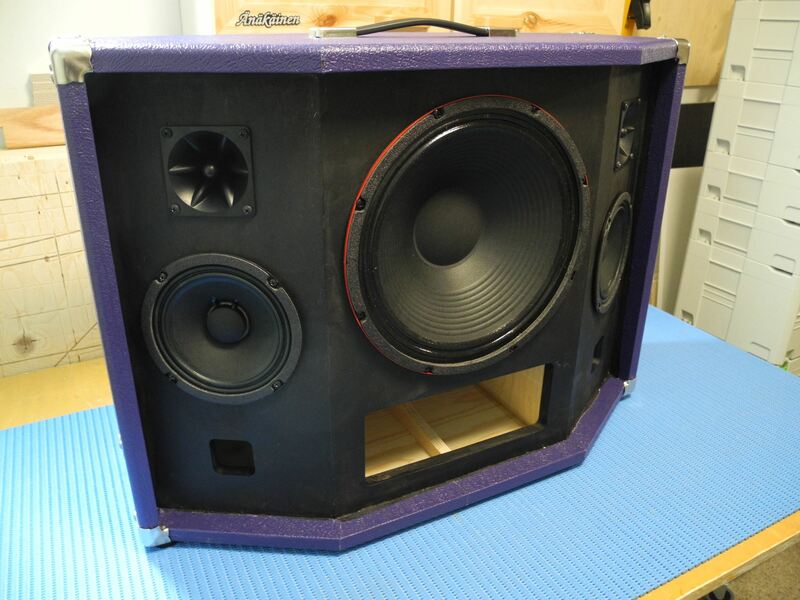 The basic idea has been borrowed from bass-reflex speaker, which are often used in Hifi- and bass (amp) cabinet designs. In the Rumble the opening is mainly used for sound dispersion, as the speaker doesn’t feature any internal reflectors, tunnels or a ”tuned” bass port. 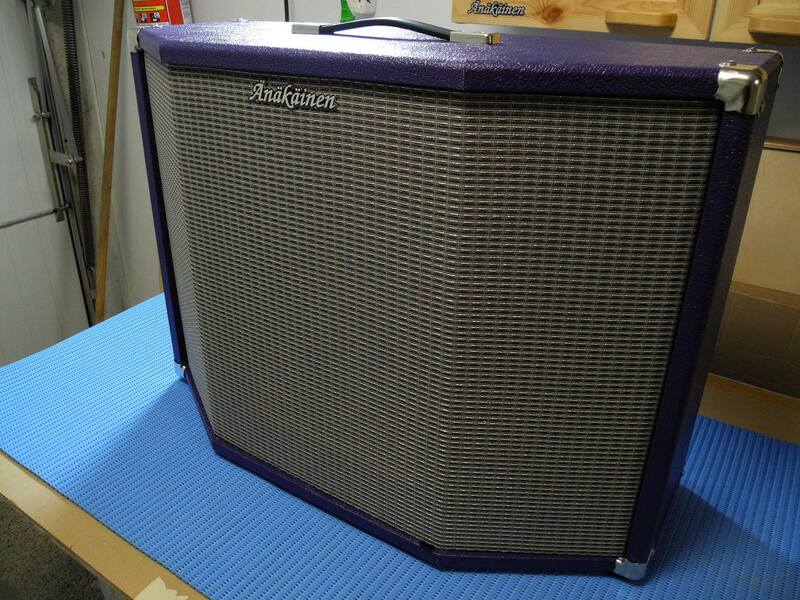 The details of the cabinet build is also a little bit different to your run-of-the-mill guitar cab. The cabinet itself is crafted from Finnish conifer plywood with a thickness of 15 millimetres. The advantages of conifer plywood are its quality, abundance and light weight. 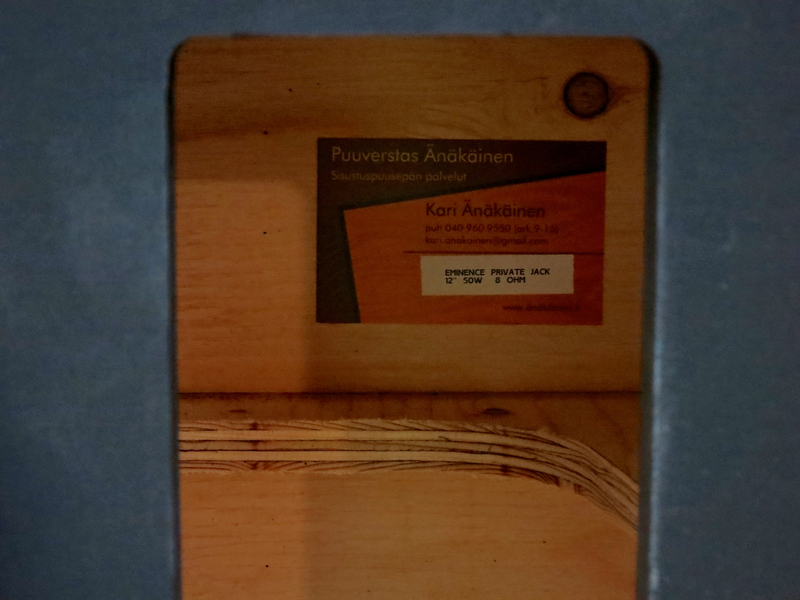 Most other cabinet makers will claim that this type of plywood is too soft and pliable for cabinet-making, but Kari has found his own solution to this problem: He uses internal struts and supports made from the same material. The speaker baffle, on the other hand, is made from very sturdy, 18 millimetre thick Finnish birch plywood. 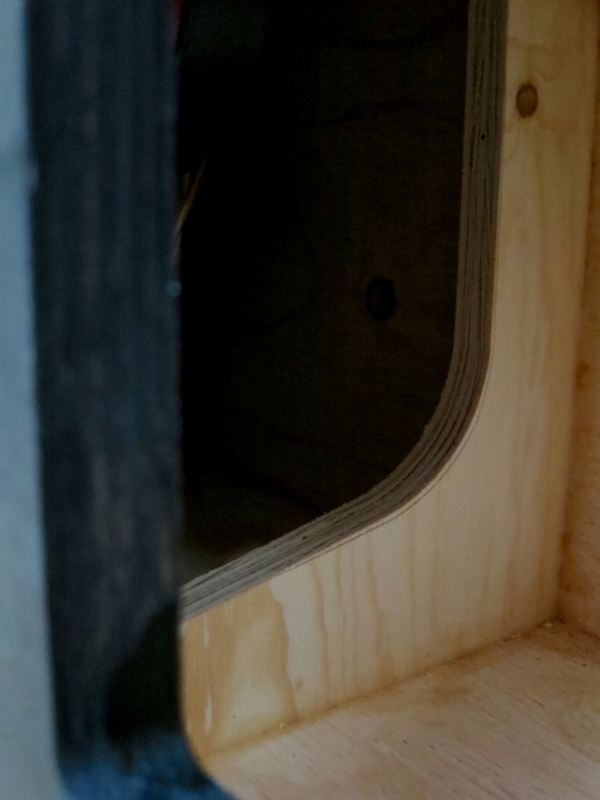 The whole speaker cabinet is constructed using only glue joints and wood dowels. The only screws in an Änäkäinen Rumble are those keeping the speaker, the jack plate and the corner protectors in place. The Rumble’s low weight of approximately 12 kilos is easy to lift by the cab’s top handle. 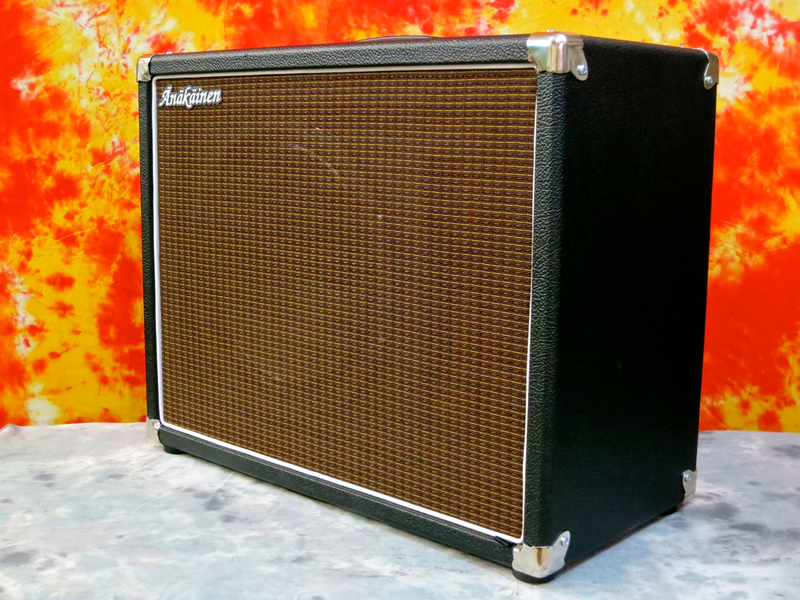 The first – completely subjective – impression I got from using the Rumble 1 x 12 was of a ”loud”, ”big” and ”musical” sounding cab. The Änäkäinen even made my tiny Blackstar HT-1R sound like a full-size tube amp. The Rumble gets across a healthy shot of warmth and transparency – just like many other quality cabinets – but its special, front-ported construction adds an amazing amount of spread and directivity to the sound that is all its own. The sound dispersion is neither too narrowly focussed, nor is there any sound getting ”lost” behind the cab. 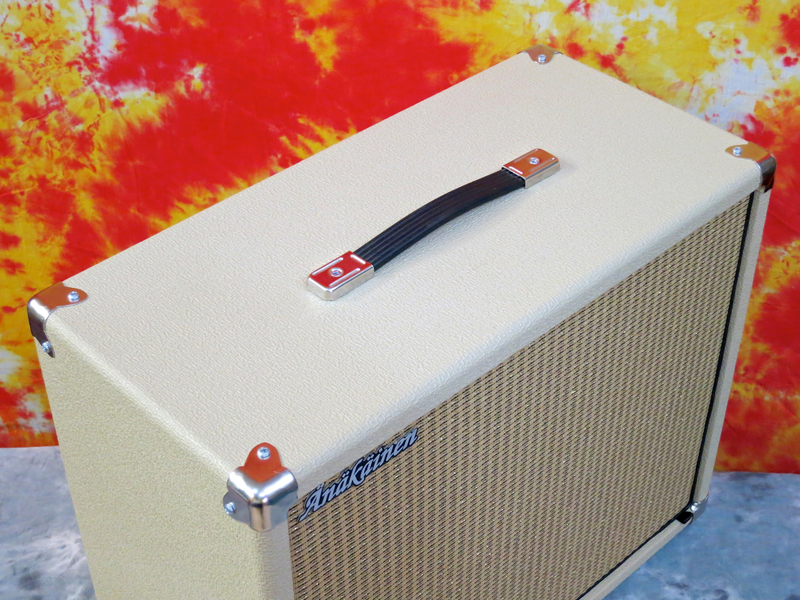 Thanks to its front port, the Rumble delivers a larger-than-life, Cinemascope-style sound. I must say I really like these Änäkäinen Rumbles a lot! They deliver excellent, boutique-class tones at a very fair price. 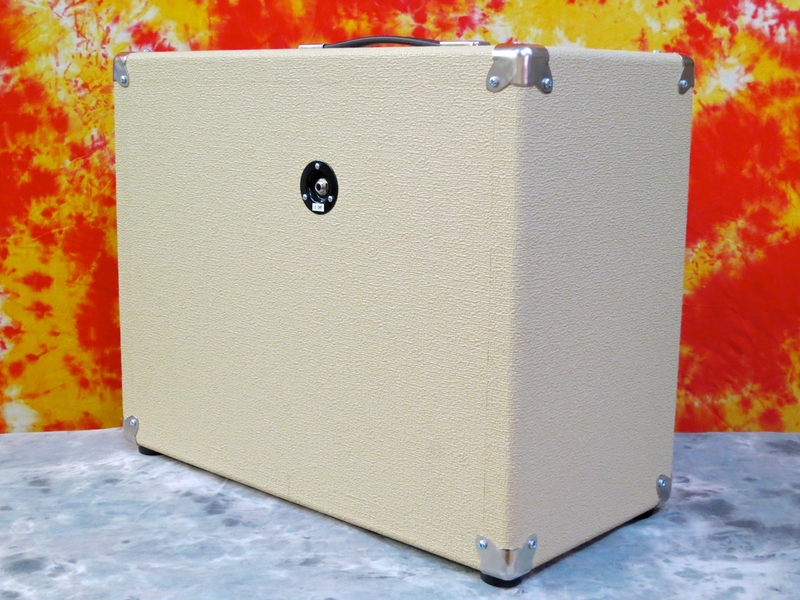 If you need a relatively compact guitar cab with a big sound, you should really consider going for a Rumble! Puuverstas Änäkäisen Rumble 1 x 12 -kaappi (hinnat alk. 580 €) tarjoaa tuoreita suomalaisia ratkaisuja hyvän kitarasoundin perustaksi. Rumble-konseptin takana ovat puuseppä Kari Änäkäinen, jolla itse on myös kitaristi- ja basistitausta, sekä kuusankoskelaisen Triodipajan vetäjä Lassi Ukkonen. Rumble-kitarakaapin suunnittelu alkoi puolivahingossa, kun Kari päätti rakentaa itselleen kevyen ja kompaktin bassokaapin ja pyysi Lassia laskemaan hänelle siihen oikeat mitat. Onnistuneen bassokaapin perusteella syntyi idea tarjota kitaristille laadukkaita, kompakteja ja kevyitä vahvistinkaappeja. Yksi Änäkäisen ensimmäisistä asiakkaista muusikkopuolelta oli kitaralegenda Juha Björninen. Rumble-kaappien kosmetiikan suhteen Kari Änäkäinen on vannoutunut vintage-mies. …ja toisella enemmän Marshallin suuntaan nojaava värimaailma. Vankantekoiseen jakkilevyyn on liimattu selkeä impedanssitarra. Kari Änäkäinen tarjoaa asiakkailleen viisi erilaista 12-tuumaista kaiutinmallia, joista voi valita sopivan elementin omaan kaappiin. Testissä käyneeseen kermanvaaleaan Rumbleen oli asennettu Eminence Private Jack -kaiutin (50 W/8 Ω). Mustaan Rumbleen taas on valittu WGS:n Reaper-malli (30 W/8 Ω). Kuten näistä kuvista näkyy, yksi Rumble-kaappien erikoisuuksista on kaiuttimen viereen sijoitettu ääniaukko. Idea on lainattu useissa basso- ja hifikaapeissa käytetystä refleksirakenteesta, vaikka Rumbleissa ei ole ääntä heijastavia väliseiniä tai viritettyä bassoputkea. Rumble-kaappien perusrakennekin poikkeaa tavallisesta kitarakaapista, sillä kotelo on tehty kotimaisesta, 15-millisestä havuvanerista. Havuvanerin edut ovat sen laadukkuus, hyvä saatavuus, ja etenkin materiaalin kevyt paino. Monille valmistajille havuvaneri on kitara- ja bassokaappien tekoon hieman liian taipuisa, mutta Kari Änäkäinen on löytynyt tähän ratkaisun – samasta materiaalista tehdyt sisäiset tuet. Kaiutinta kantava etuseinä taas on leikattu 18-millisestä, suomalaisesta koivuvanerista. Koko kotelo on toteutettu täysin ilman ruuveja, ainoastaan liimaliitoksilla ja puutapeilla. Rumble-kaappien ainoat ruuvit käytetään kaiuttimen, jakkilevyn ja kulmasuojien kiinnityksissä. Rumble-kaappi on hyvin kompakti ilmestys, joka painaa vain noin 12 kiloa. Tämä perustuu vain subjektiiviseen vaikutukseen, mutta ensimmäiset sanat jotka tulivat Rumble-kaappien kokeilussa mieleen olivat ”äänekäs”, ”iso” ja ”musikaalinen”. Änäkäinen Rumble saa jopa oman Blackstar-pikkuvahvarin (HT-1R) kuulostamaan täysikokoiselta, aikuiselta putkivahvistimelta. Rumblessa löytyy se sama lämpö ja avoimuus kuin monissa avoimissa kaapeissa/komboissa, mutta sen erikoisen rakenteen ansiosta äänen suuntavuus on huomattavasti parannettu. Tässä ei katoa puolet soundista johonkin kaapin taakse. Samalla etupuolen ääniaukon ansiosta syntyy sellainen herkullinen, huonetta täyttävä ”laajakulma-soundi”. Tämän testin perusteella voin vain todeta, että Änäkäinen Rumble -kaappi tarjoaa aitoa suomalaista boutique-laatua reiluun hintaan. Rumble todella kuulostaa isommalta kuin mikä se on.